Apiacás Arquitetos uses standardised modular elements to design a multi-purpose pavilion serving an apartment building near Barra do Una, the famous beach close to São Paulo, Brazil. 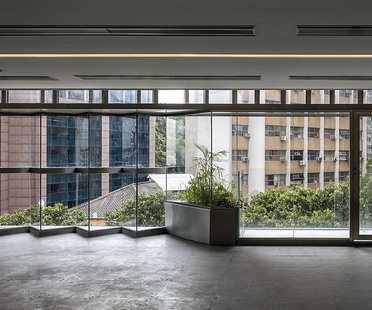 Urban renewal and green retrofitting are the keys to Triptyque’s RB12 project in Rio de Janeiro. Triptyque’s RB12 office building in Avenida Rio Branco is part of the “Porto Maravilha” project commissioned by the City of Rio for the 2016 Olympics. Breaking the siege, Gabinete de Arquitectura’s contribution to the Architecture Biennale in Venice, has been awarded the Golden Lion for best participant in the 15th Architecture Exhibition, REPORTING FROM THE FRONT, curated by Alejandro Aravena. 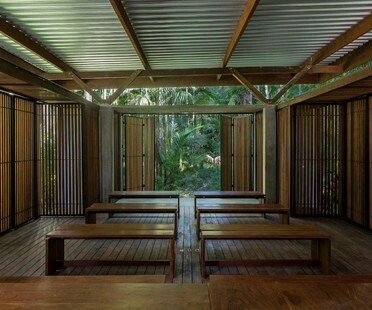 Brazilian architectural studio Mareines+Patalano Arquitetura, headed by Ivo Mareines and Rafael Patalano, have now also completed the third phase of the MOPI primary school in an urban but very green area of Rio de Janeiro.